A national campaign to raise funds to fight the biggest cancer killer of children and adults under forty gets a welcome boost from East Anglia-based value retail group QD Stores this month. Staff at the company's 40 stores in locations extending from the East of England and Home Counties to Doncaster and Wrexham are taking part in Brain Tumor Research's 'Wear A Hat Day' appeal on March 28th 2013 as part of Brain Tumour Awareness Month. QD will be the only retailer selling newly-introduced Brain Tumour Research Car Hats during this month. 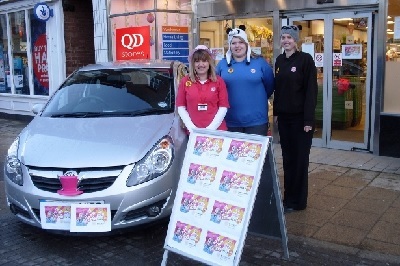 The fancy toppers, which fix to car front grilles, retail at £5 each with all income from their sale this year being donated by QD to Brain Tumour Research to fund vital research into the disease. "Brain tumour research receives less than one per cent of national cancer research spending in the UK, yet it kills more children and adults under the age of 40 than any other cancer," says QD Group managing director Justin Farrington Smith. "Wear A Hat Day is a fun way of increasing awareness and getting people raising money for vital research to find a cure for an often overlooked form of cancer." Norwich-based independent QD operates over 40 retail outlets under the QD, Buyright, Lathams and Cherry Lane Garden Centre brands, in locations extending from the East of England and Home Counties to Doncaster and Wrexham.